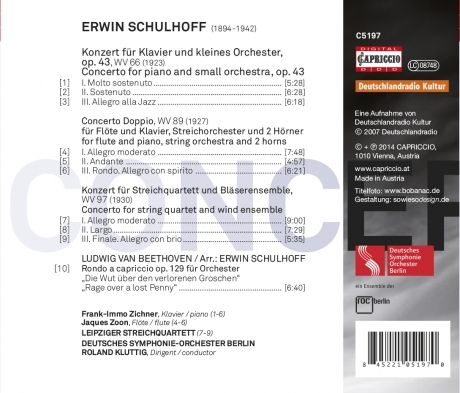 Erwin Schulhoff, born in 1894 as the son of a rich businessman in Prague, already knew as a small child that music was to become the most important thing in his life. As an internationally successful pianist and composer, he was one of the most important Czech artists in the first half of the 20th century. The young composer abruptly became aware of the earnestness of life with the outbreak of the First World War. 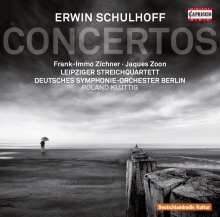 Schulhoff felt disgust at the horrors of combat he experienced first-hand as a soldier. He could not compose during this period. In 1918, he noted in his diary in profound disillusion: ‘It is an atmosphere in which it can frequently happen that you lose faith in yourself’. In Dresden Schulhoff came first into contact with a young artistic generation of Dadaists. For the artists scarred by the war, Dadaism was an expression of their attitude towards life: rage, helplessness and nihilism found expression in word and image as glaring derision, scorn and shameless provocation. In this climate, Schulhoff discovered the jazz that was spilling over from America. This, too, can absolutely be seen as a provocation in the Dadaist sense. The Concerto for Piano and Small Orchestra WV 66 is a wild blend of Impressionist, late-Romantic and jazz-inspired sounds and rhythms.